When Down syndrome (DS) makes my Facebook trending sidebar, I click the link. By now you’ve likely seen the article on Sam Forrest heroically taking his son when his wife allegedly abandoned him. And the internet exploded with outrage followed by the desire to “do something to help.” As of this morning Forrest’s Go Fund Me account has raised over 475K. Please let that sit for a moment. Complete strangers who heard the initial story of Forrest’s desire to move his child to his native New Zealand following resulted in nearly half a million dollars in funding in 12 days. – “Forced to choose” wife over child resulting in divorce. Within a week of the child’s birth. Haters gonna hate and that’s what happened online. So, let’s get this right. Before the baby was born the mother was working, the father was not, and they were living with family to support them. Red flags people! I question Forrest’s outspoken desire to work part-time in order to care for his child. Who wouldn’t want to work part-time to raise their child? This sentiment expressed by the father further reinforces the narrative that children with Down syndrome require more parental time and attention than other children. Yes, many times children with DS require more medical support especially in the first year of life, but this does not necessitate part-time employment. What occurred here was a baby was born in country with nonexistent infrastructure to care for child with a disability. The diagnosis delivered in a way consistent with the country’s view of disability. – Volunteer with disability organizations like Best Buddies There are many ways to support the lives of those with Down syndrome and other disabilities other than an individual Go Fund Me plea. A story that grabs at your heart shouldn’t be simultaneously grabbing your wallet. *Suggestions do not imply endorsement and are given as ideas to get you thinking about ways to give of your time or money. Having worked in Russia and being of Armenian descent, I know firsthand the pressures this mother speaks of. It is hard for those of us living in the U.S. to imagine raising our child with a disability in a place where there are NO services. None. Add to that the fact that in some cultures, disability is treated as something shameful to be hidden. This mother was facing all this at a time when postpartum hormones can make everyday decisions like what to wear a challenge. We don’t know this family. I choose to believe that this mother’s actions were rooted in fear for her child’s future. I am sad at how the world rushed to judgement and condemned her. Aileen, Thank you for your encouragement. It’s not my intention to condemn Samuel Forrest for asking for help. When stories like this hit the headlines people respond. My hope is that response will be thoughtful. Thank you for this thoughtful response, Jen! Agree 100%. This story has irked me from the moment I saw it- thinking about the single moms we know who are somehow raising their babies without a public plea for dollars. In other words, being a mom. Also…Piggy backing on a tangent here… We are in desperate need of more, no- make that ANY- support for birth mothers who have made the loving choice of an adoption plan for their babies. There’s nothing. Not a book, a website, a blog, nothing. Just lots of tacit shaming – as evidenced by stories like this. Julie – Thanks for reading! I appreciate your encouragement and feedback. The world is full of enough shame. Adapted from a response I made on Facebook today: Baby Leo’s mother delivered a child considered an outcast in her society and for whatever reason chose to place the child in the care of is father. There are many stories of fathers abandoning their children with disabilites at birth but this counters that reality giving the story traction in the media. People frequently decide they cannot parent a child with disabilities in the US – it’s called an adoption plan. There should be no shame in this choice. Two of my siblings were adopted because of their parents heart-wrenching decision to create an adoption plan. Rather than let the story play out as hero father-heartless mother, my desire was to highlight an ever growing trend: Internet outrage and our desire to fix everything with a collective wiping of the hands as we empty our wallets. There are rather large holes in this story. My hope is that people who are interested about the lives of those with disabilities will look at the practical ways to support. 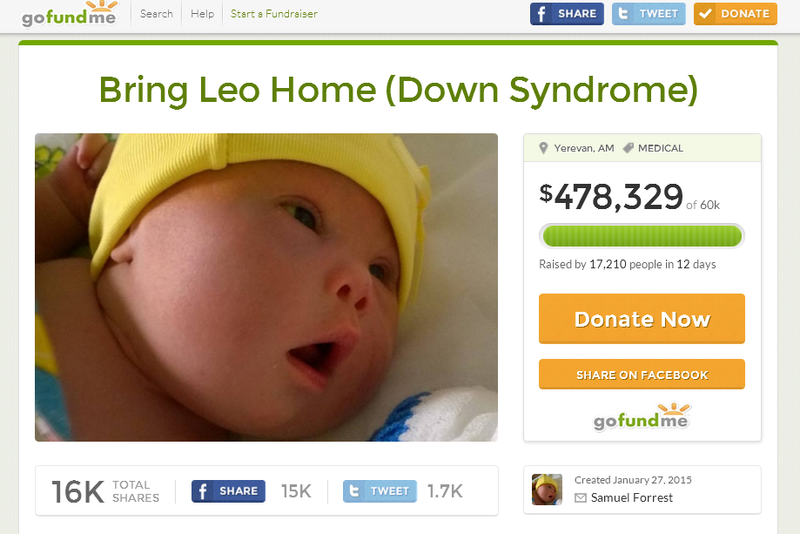 Not bring further shame to a mother or further fund a father who has now earned 1/2 a million dollars in 12 days.